[S38] Christina Ray [okchristinabelle@yahoo.com http://familytreemaker.genealogy.com/users/r/a/y/Christina-Ray-1/WEBSITE-0001/UHP-0604.html]. Letter from Hiram Richardson to Mr. Horatio Moore, Huntland, Tenn. Your letter of recent date inviting me to the reunion of your two sisters and four brothers at the home of your father near Bay Springs, Miss and also requesting me to give an outline history of our Richardsons and Moore ancestors, has been received. If my health will permit, it will aford me great pleasure to meet you at your father's old house in this coming August. I see your brother, Will and Hugh, and your sister Sarah occasionally. You, Jack and Jim, and your sister Becky, are almost lost to me in these laster years. I will never forget your stay at my house when I was tax assessor of Itawamba County, helping me make my books. This was just before the war and soon after your return from Franklin College. You helped me out of the deep water by telling me how to get three miles on an amount of property for a certain purpose, three mils for something else, seven and a half mils still for some other purpose. My arithmetric had not no mils in it. Now let me give as best I can the history of our ancestors. My understanding is that the Moore family came from Ireland before the Colonial War. Your great grandfather, Robert belonged to the Colonial Army, and was killed in the battle of Guilford Courthouse. He left three little boys at the time of his death, Robert, John and Fanning. Each reared a large family in Moore Co. North Carolina. Robert, the oldest of the three, left NC about year 1820, and located in Strawberry Plains, Jefferson Co. Tennessee. Fanning and his family, as far as I know, with the exception of his son Robert, remained in the old North State. John Moore, your grandfather, married my Aunt Mary Richardson, and lived in Moore Co. till the early twenties. His three sons, Robert, your father, Stephen Richardson Moore, John and Hugh were all born and mostly raised in Moore County, NC. Also their three daughters, Elizabeth married Alfred M. Carroll, Nancy married John Hood, and Mary married William Gee. The death of your father at Alton Ill. in military prison was sad. He refused to take the oath and was sent to prison. Your uncle Hugh was killed in the battle of Harisburg Miss. But you know more about the Moore family probably that I do, though I have known Uncle John Moore all of my life and each member of his family. He died near Bay Springs about 93 years old ain 1862. His good wife, my Aunt and your grandmother, died soon after he did about 90 years old. My great grandfather and your great great grandfather Richardson was a native of North Carolina but born in Wales. His son, William Richardson was a native of North Carolina and a soldier in the Colonial War. He reared a large family in NC. When quiet an old man, he and his wife and then a large family of children and grandchildren left Moore Co, about 1822, and settled in Lauderdale County, Alabama. The oldest of his three children, Uncle John Richardson married Aunt Kate Stutts in Moore County NC and moved to Giles County, Tenn. My father, then single, Mat Richardson soon followed Uncle John and spent a year or two in Giles County, Tenn., where he married my mother, Tabitha White. These two brothers, John and Mat Richardson, in looking for a suitable place for themselves and kindred to lacate permanently, determined to settle in Lauderdale County, Alabama. They settled on Blue Water, or rather a prong of Blue Water, which took its name from the pioneers. Here they cleaned and cultivated the rich productive soil and underwent all the toils and hardships of all industrious pioneers. 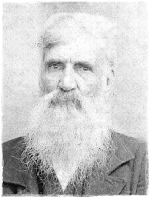 Uncle Issac Richardson, the youngest of the five brothers, came next and joined Uncle John and father in Lauderdale County. He married Miss Sarah Thornton and settled near his brothers on Blue Water. I was the oldest of fathers family and quied young to have as clear and distinct a recollection as I have of the approach of a covered wagon train, mostly drawn by oxen accompanied by many men, women and children, cattle, sheep, hogs, chickens, turkeys, last but not least dogs. This was quiet a eye opener to me. Uncle Stephen Richardson, for whom your father was named, Uncle Isham Richardson with their large families and their belongings, their brothers-in-law, that is men who married their sisters, viz; Uncle Jake Stutts, Uncle John Moore, Uncle Jim Myrick and Uncle Jake McGee with their large families came. Some married and had small families and brought their belongings from NC to begin life anew in the wilderness of a new country., They all arrived after a toilsome journey across the mountains, the unbridged rivers and unbroken forests. The cordial greetins and happy incident to the coming of so many impressed me. Your father was about 18 or 20 years old. He was active and sterring. He had driven an ox team the entire long journey. The joy and happiness of all was killed as the worthy patriarch of the colony, William Richardson, died on the way and was buried at the foot of a hill or mountain by the road side near Knoxville, Tenn. All rested for a time during his illness. While thus watching and resting, an man by the name of Spence or Spencer was recognized, who had years before murdered his wife in Moore County, NC and made his escape. He was arrested, jailed and finally hung for his crime. Soon after the arrival of these ambitious and happy adventurers, choice lands were selected for each family. The pioneer enviroments required backbone and nerve. Soon, all were busy building houses, clearing and enclosing lands in order to make a support and provide necessary comforts. There were no drones in this busy hive. Modern luxuries and conveniences were not known, but the substantials for lived and raiment came as a result of the continous toil. Pioneer conditions appealed to and were recognized by men, women and children. This happy and prosperous colony was supplemented by others from time to time. Your grandtather, John McDougal, and many others from Cumberland County, NC cast their lots as permanent settlers in this inviting locality. Your father and Miss Lucy McDougal married about the year 1828 or 9. By energy and economy they soon enjoyed a good home. But they, with my father and others of the colony moved to north Mississippi about 1835. My grandmother Richardson, your great grandmother, was old and feeble; well cared for but sad because the body of her husband was left amoung strangers. All of her sons and daughters had left their NC home and settled in Lauderdale Ala., but her new home with all its surroundings did not appeal to her like the one in the old North State that she left in which her long and eventful life had been spent. Uncle Stephen Richardson settled on Cow Pen Creek, where he improved a good farm. He was the first of the Richardson family to pass over the river in Lauderdale County. Some time after his death his widow and family moved to Tenn. Uncle John Richardson spent his long and useful life on the farm he located on. His good wife, Aunt Katy, was a fine character. She lived to see 106 years come and go.. His only son, Henry Richardson married a cousin of your mother, Nancy McDougal. He was a financial success, a good farm trader and admired fine stock. They moved to Kaufman County, Texas years since, about the time your Uncle Joseph McDougal moved to Smith County, Texas. Uncle Isham Richardson and Aunt Julia reared a large family, lived to a good old age and many of their descendants still live in Lauderdale County, but some are scattered. their sons, Henry and Asa went west many years since. Uncle Jake McGee and Aunt LIzzie each passed by several years and three score and ten mile post. Their large family scatered but some are still about the old home. Uncle Jim Myrick and Aunt Sallie reared a large family. Some went west, other are still in their old home country. Some may have gone to Tennessee. After Aunt Sallie's death, sad but true, Uncle Jim shortened his life by excessive drink. He died in Mississippi since the war. Not withstanding his weakness on the drink line, he was honest, truthful and industrious.